Mumbai: The country’s second biggest maker of trucks and buses, Ashok Leyland Ltd, will be “cautious" about expansion plans as commercial vehicle demand is set to slow, its chief financial officer K. Sridharan said. Ashok Leyland’s sales declined 20% in August as interest rates near a 16-year high and cooler economic growth dampened demand. Asia’s third largest economy grew at the slowest pace since 2004 in the three months to June, hurting demand from freight operators and construction firms. “We are cautious purely because sentiments have changed," Sridharan said. “People are talking about the world going into recession and the Indian economy also getting affected." The company, partnering with Nissan Motor Co. Ltd to make light trucks in India, had said in June that it plans to spend Rs3,200 crore on capital expenditure over three years to more than double vehicle production capacity. Ashok Leyland is close to finalizing a plan to raise as much as Rs500 crore of debt from the local market, Sridharan said. Rising interest rates in India means the loans will be costlier by as much as 150 basis points, he said. A basis point is 0.01 percentage point. The truck maker on Tuesday announced a joint venture (JV) with US-based agricultural equipment maker John Deere for construction equipment to tap a growing focus on infrastructure. The venture will start production in early 2010 and is scouting for locations for a manufacturing plant in India, the company said in a statement that did not disclose financial details. The JV will cater to both local and overseas markets. 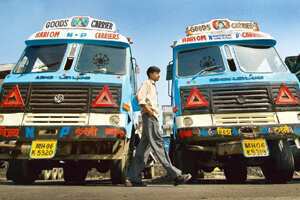 Shares of Ashok Leyland gained 2.12% on Tuesday to close at Rs26.50 on the Bombay Stock Exchange.